A tasty electrolyte drink that reduces cramps and dehydration and aids in recovery. Contains a blend of simple and complex carbohydrates, amino acids, antioxidants and electrolytes. Choose from Orange, Fruit Punch, Grape or Lemon Lime. This is my go to electolyte. I'll use a just about anything for electrolytes, but this stuff I use on big training days or race day. I am partial to the fruit punch and the taste hasn't got old yet? I swim and bike 12 months of the year. 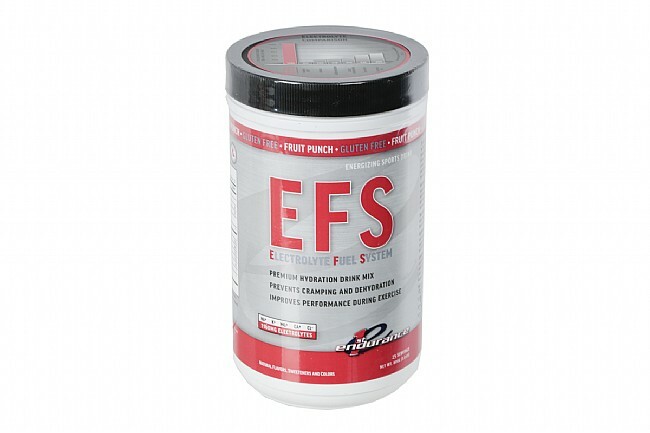 I use EFS electrolytes as my primary replacement drink in my H20 bottles. 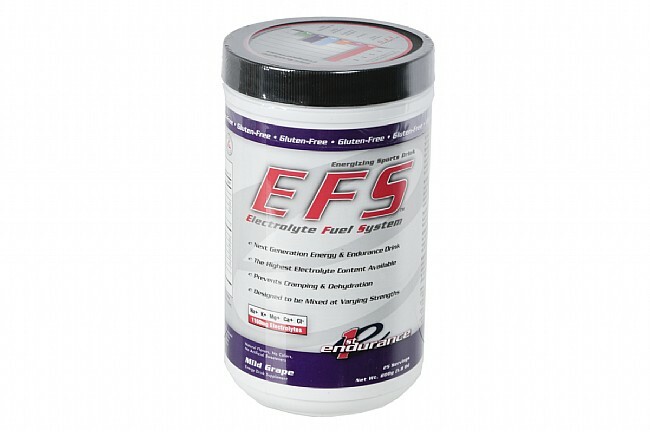 Prevents cramping when used correctly (read the EFS bottle and website). 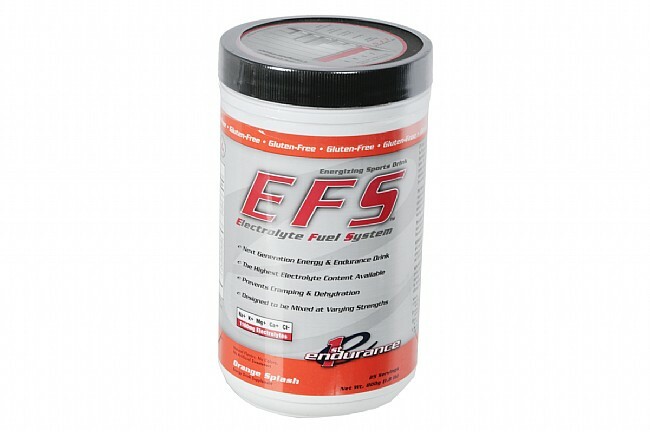 I use EFS when riding over 2 hours and as a preload prior to exercising in heat even under 2 hours long session. Put this in your kit, it works and has good flavors. 5 years of using EFS for all endurance training over one hour. Consistent performance and No. digestive problems . ( 68 ) I have trouble with leg cramps , EFS works very well to keep the legs fresher . This product makes those plus 50 rides a little less painful. Easy to mix and very easy to digest. The lemon lime is a nice flavor and not too sweet. Love this product, my go to training and race fuel, best flavor, fruit punch! I've used this product for 3 years, primary during long training runs and bike rides and races. I use 2 scoops per 24oz bottle. it's helped me successfully complete 5 half Ironman races and one full. Although I wont use any comparable products, this EFS didn't work so well for a friend. It's worth a try if your not satisfied with your current electrolyte product. This is the only drink mix I use and actually feel like it really helps! I feel like it hydrates and adds good calories during my rides. Not the cheapest mix available, but I like the fruit punch flavor whether cold or warm. Not too sweet or sticky. Seems to have enough electrolytes to help with cramping (though maybe placebo effect at work). It does require a fair bit of agitation initially to get thoroughly dissolved. Great taste, works really well. I always like the lemon-lime flavor. It has high sodium and electrolyte content. Just one scoop per small bottle, I carry two bottles. This is one of a very few products that doesn't hurt my stomach. For a long ride, it really helps. This is a great product I've used with my cycling for 2 years. Use two scoops with 24 oz water for routine exercise., add EFS Liquid Shot if you're planning to really hit the pedals for rides two hours or longer. Invigorates and doesn't upset stomach. Love this stuff. Switched from a higher calorie brand with no amino acids for First Endurance which has both qualities. The taste is light in the lemon-lime flavor. It has high sodium and electrolyte content, and I use one scoopful for a large bottle. Calories are low, so I take additional food on long rides. I would say recovery is improved for me, which may be due to the amino and malic acids. Price is high, particularly if I followed the product's recommended concentration. Works so good I bought 3 cans of it! Used it in 160 km grand fondo felt great through whole event, and had a great time. had trouble with cramps on hot days this has really helped. Great tasting, works really well. This product really works well for endurance and rehydration. Only problem is that is really not water soluble. I have to dilute in hot water and add ice if I want to drink immediately. Otherwise, it takes a long time to dilute. great product with a solid focus on electrolytes. Not just another source of carbs. I had been a long time Cytomax user but found that I had mental fatigue on longer rides no matter how much a drank. I had no idea that I could fix that just by changing out I had in my bottle. I first used this on Levi's Gran Fondo a few years ago and I had no mental fatigue issues at all. In fact I felt better than I had on any of my longer rides before. If you sweat a lot or ride in hotter temps you really need to give this product a try. Also, it is worth mentioning that the flavor reminds me of Sweet Tarts candy, so if you didn't like those as a kid you probably won't like this either. it is a good product and use as directed on the label to avoid cramps. The grape flavor is pretty good. It is a more salty taste to it compared to gatorade, but still good. It reminds me of taste of energy gels. I went on a 35 mile ride and did great 34 of the way. I ran out of this drink and I cramped up real bad the last 14 of the ride. It says on the label to drink every 30 min of intense exercise. Follow this advise to avoid cramping like me. I would buy this product again in the future. The best stuff for long rides. Pros Lots of electrolytes and it keeps my energy level constant. One scoop per water bottle will do ya'. High mineral replacement without the high sugar. 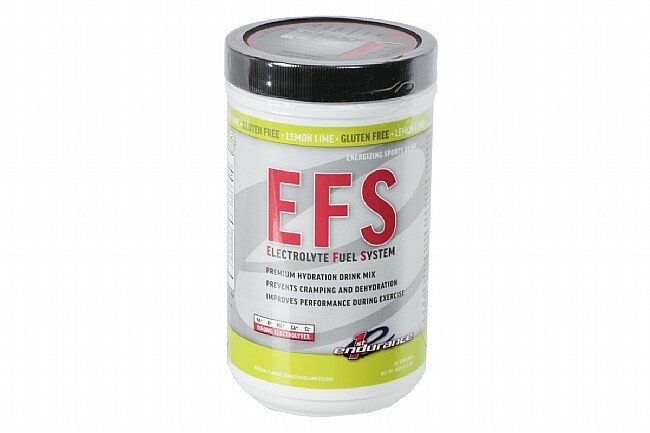 I've been using the EFS for some years and like it better than any other drink for electrolyte replenishment. Helps to keep the legs from cramping on the longer rides and really great for the sweltering Florida Summer heat.